I often think about patterns from my childhood... Fabrics, tile, wallpapers, even linoleum patterns. Many of them have really stayed with me over the years and I remember them fairly clearly. For the ones that are no longer around... I wish I could just have a piece... A yard or a square foot to look at and remember perfectly. The sofa in the photo below was upholstered in a beautiful chinoiserie floral in orangey-pinks, cream and green and was in my grandparents' living room in Honolulu many years ago. 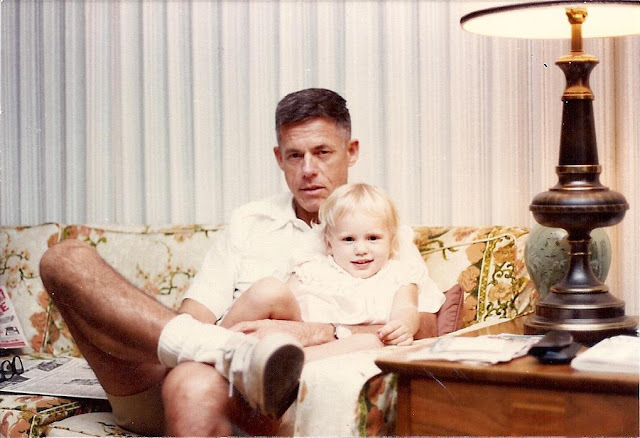 I've seen the photo below of my grandfather & me over the years (and I'm not sure at what point I started consciously thinking of the fabric) but it's just sort of always been one of those fabrics filed away in my mind that I think of every so often and love. 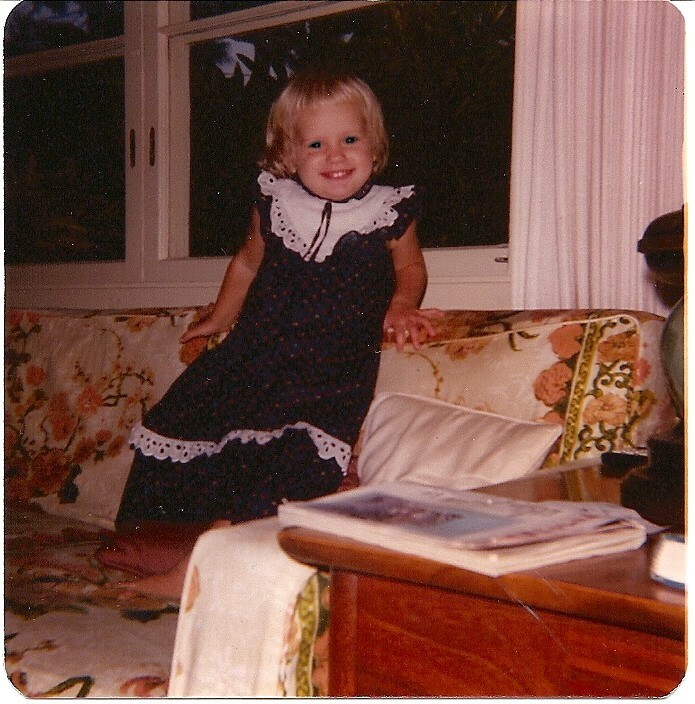 Below is another photo of me in my muumuu on the beloved sofa fabric. My mom and I moved in with my grandparents to McLean, Virginia (just outside of Washington, DC) when I was 4 years old. My grandmother has an amazing sense of style and we lived with them for 6 years before moving only a few minutes away. When I find things that remind me of pieces my grandmother's had over the years, I often buy them on the spot. They just give me this good feeling. It's almost that feeling you get when you first wake up and you can't quite remember a dream but then you do and it just feels so good. Does that make sense? 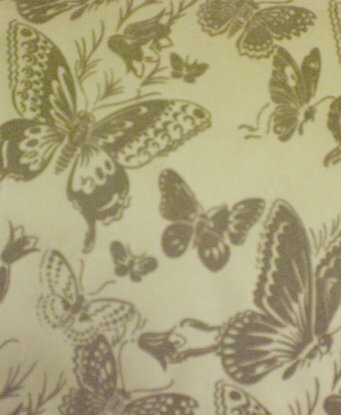 My mom had this vintage butterfly quilt in cream and earthtones... I wonder if it's still around? My Aunt Josephine had these beautiful japanese gardens with stone pagodas that I'll never forget... My grandmother has a beautiful blue and gold floral throw blanket made by my great grandmother (I think?)... Terrible linoleum in the kitchen (not picked out by her I don't think) that I used to love & stare at... It was fun finding shapes in the linoleum and I'd always show people the "two dinosaurs" I'd found throughout the pattern. It's since been replaced and looks so good, but I can't help but miss that pattern. Even as I write, I'm struck by the flood of memories & feeling that seeing or remembering patterns and objects from my past elicits in me. I am so happy when Christian asks to be lifted up to see something on a shelf- like the little froggy limoge box that sits on our bookshelves. He gets to hold it and play with it for a little bit before we put it back, just like I used to be allowed to do. What we put in our homes today affects our not only our present, but is also the backdrop for our future memories. If you have kids around noticing the things, you just might be helping to develop their taste, style. The fabrics and patterns from my past are so ingrained in my memory that I know they've influence my design aesthetic. As I work on fabrics for the my upcoming fabric line, I'm amazed by how many of my ideas spring directly from the patterns of my past. To some people, picking the fabric for a throw pillow may be as easy as running to Target and choosing a color that works with their rug... to me, it's way more than that... (although the pillow could be from Target! ;) It has to elicit an emotional response from me or my client. A fabric I choose is typically somehow tied to the past, memories or a feeling -although I (or they) might not even know it at first... Designing a home's a big deal to me and those little choices are all a part of the equation. Your thoughts?? Have a beautiful day Lauren! Wonderful photos of you with your grandparents, and that sofa and lamp on the side table are really fabulous! I was very interested in all the fabrics and items around me growing up and putting together a home is incredibly important to me...it's more than the colors or furniture, it's how it makes you feel in the space and what that means for your life and family. I've been thinking about this a lot lately, decorating can seem very trivial, but when you start to get under the surface it has a lot of powerful emotions tied to it. i love this sort of posts (though I love all your posts!). For me, too, fabric is so much mre than fabric. Every layer revokes a memory. Ecstatic to hear there's a fabric line in the works! Good luck with that! I would visit my Great Aunt Louise and admire her antiques and we would have fruit-cake and harvey's bristol cream. I refer to her as one of my "cultivators~"
I wish she were still here. She never had any children but she had so many nice pretty things. I know I owe so much to her. Design is one part collective, one part intuitive and so personal. Our ideas are shaped so young, let's hear it for the formative years. There is an enormous antique mall in my area and as I walk the aisles I see so many things that remind me of my grandparents home. It's fun walking down memory lane, isn't it? Now you have started me on the memory trail I'm off to reminisce for awhile. Thank you! I'm totally with you -- I have powerful memories of my bedrooms growing up (loved that funky 70's jungle pattern on my sheets! 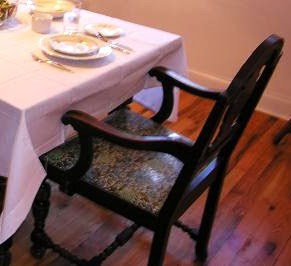 ), and of fabrics from upholstery. When I look at old pictures, I see the furniture before I see the people! That lovely picture of your grandmother -- that looks like a Brown Jordan chair she's sitting on? What a great post, thanks for sharing. I'm sure I'm not alone in saying that you've brought back personal memories in all of us who are reading it! What a lovely post! Brings back so many wonderful memories. My style was greatly influenced by both of my maternal great-grandmothers. I wish I had more pictures of their homes to remember. That picture of you with your grandmother is just darling - I hope you have that framed! Lauren, this is such a beautiful post! One of my favorite things in the world to do is visiting my sisters' homes and seeing all the things that remind of us of our grandmother, which they've found and worked into their own homes. So many memories inform every choice! Thank you for writing this. It makes me feel less crazy. I will search for months to find the perfect throw pillow. I need that emotional response! I have very fond memories of a terribly ugly, scratchy, yellow plaid couch with a pull-out bed at my grandmother's house. This is one of the best, most evocative things I have read in a long time. As I put together my first home, it became more and more obvious to me that my taste comes from my father's mother. And as members of my family have visited me, quite a few have pointed it out. This makes me want to go through my home and try to connect the dots between my choices and hers. Love it. Thank you for such an inspiring piece! I LOVE this post! I hate it when my favorite bloggers tell me what is "in style". I think our homes should reflect who we are, where we've been and where we want to be, instead of looking like a carbon copy of everyone elses home. I love this post! I can really relate to what you have written. One of my favorite houses was my Grandmother's bungalow in a tiny town in SW Oklahoma. It was full of treasures including glass door knobs and a built in china hutch in the 1930's kitchen! Beautiful Grandmother........I'm going to remember that one. Brilliant woman! OMG! christian looks just like you when you were a child. as i was reading your post my mind would wander and remember long forgotten bits of long ago decor. some good, some bad........my grandmother had plastic on all the upholstery! crazy for that last print with the tigers and deer. I completely agree that decorating your home is an emotional experience. It is typically your biggest investment as well as where you spend time with loved ones. If a piece doesn't evoke an emotional or memory, it may just not be the piece for your home. I remember things both of my grandmother's had in their homes. My only living grandparent, Mawsie, just turned 92 last month. It is always a treat to sit and talk with her. Her mind is just as sharp as it was when I was a child. Great, great, great post! Fabrics and patterns have the power to evoke emotion and nostalgia upon seeing them. And, I loved the last part where you talk about creating the same type of feeling for your own children. There's a song and it fits that perfect...talking about the "house that built me". Since I’m an antique textile dealer fabrics mean so much more to me. I’m a dealer thanks to my Grandmother who got me interested in fabrics when I was young. Love your post and what a cutie you were…ARE!…lol. 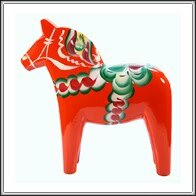 The red Scandinavian horse brought back memories for me. We lived in Finland when I was 3 years old. My parents purchased a black one and it is still displayed in our family room. I think it was actually purchased in Sweden. I'll have to ask more questions about it the next time I visit. You look exactly the same today! I too, adored my grandmother, and her home and the way she dressed has totally formed my design sensibility and style. I wear red lipstick to this day, because I loved it on her when I was a little little girl. Love the old photographs! Beautiful post. Lovely post. My style is greatly influenced by my mother's, for sure. And, when I do deviate you can tell she isn't so sure....but usually likes what I do once she sees it all pulled together. Reading your post reminded me of specific photos from my childhood where I distinctly remember the chair cushions or the wallpaper. Thanks for the trip down memory lane! I so enjoyed this post. Having 2 sons I always wondered if my love of "nesting" would have an impact on their future homes---our oldest son and his lovely wife just bought their first home and I can say "yes" I see some of my style in their choices for furnishings. you grandmother is beautiful!! I love bringing back memories with touches around my house! The first photo of you on your grandfather's lap in Hawaii shows a sofa in a print fabric with a border. I'm pretty sure it was a Greeff fabric, as they were noted for their engineered prints. The Calico Corners stores used to buy Greeff seconds and closeouts--and I recall many such prints when I first worked there. Greeff was purchased by F. Schumacher some years ago, and I think the name is no longer used in the design marketplace. 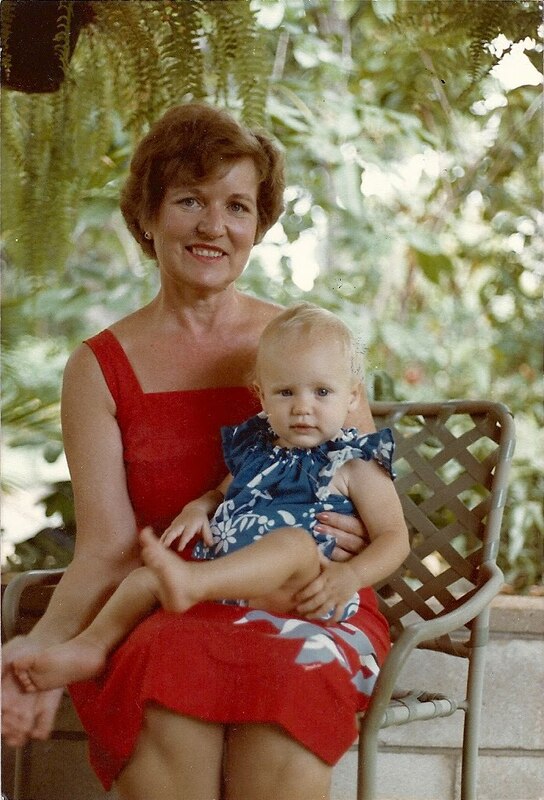 My mother--a very avant amateur decorator in southern California in the early 1950s--had large club chairs in the living room covered in a stylized tropical floral print on bark cloth. She even had painted concrete floors when the house was built, until they could afford to add wall-to-wall carpeting. I can still visualize that print! Beautiful Grandmother! I am going to have to remember that. Your boys look like you when you were a baby! I will never forget my grandmother's aqua grasscloth wallpaper and her chinoiserie accents. Her style has deeply influenced mine. Our interior spaces tell a story that is only ours to tell!! WOW! I've been reading your blog for awhile and when you just listed Antioch, IL in this post I had to do a double take. My boyfriend grew up there and I grew up in a town 10 mins from there! We just moved to San Diego and are missing home terribly so it's nice to be reminded of the good ol days! So well said. I am the exact same way and so are my kids. They notice when I make any changes. Thanks for leading us all to remember today, Lauren! You are totally right! A person's design style is shaped by their past experiences (usually childhood). I hadn't thought about it before, but I tend to wait for a "feeling" when I'm searching for the right patterns and fabrics. I must be looking for that connection to my past. My husband is always surprised that it takes me so long to choose things for our new house, but I just keep telling him that it has to "feel right". Thanks for posting this!! You are always so inspiring! I can think of several examples, but most strongly is the way my mother's childhood bedroom looked in her parent's house when I was young. It had been decorated in the 70's and still had the same green, orange, yellow, and red oversized floral wallpaper in the late 80's. My sisters and I used to sleep in there when we visited my grandparents and I remember laying awake at night thinking about how my mom used to sleep in that room -- it blew my 6-year-old mind! I recently saved the bedsheets from being sent to the Goodwill. There are threadbare and I have no idea what I will do with them, but I felt the need to keep them -- they are just so whimsical and awesome! This a great post and I completely agree with you. So much so that in some cases I own the same things that my parents and grandmother had around their houses. One being the Dala Horse. I was lucky to get the one that G'ma had. I love how beat up it is (us grand kids were a little hard on it, but it has great "patina" now). I also had to buy a few of the coffee mugs she had. I don't use them, they just make me feel comfortable that they are in my cupboard. I think this post is amazing. I thought I was the only person on earth who felt that same type of connection with my past through seeing, smelling, remembering the littlest things. I can't wait to make my husabnd read this. Now he'll see that I am not the only human like this! :) You have inspired me, yet again, to get my act together and purge our hand-me-down-only-using-due-to-laziness-and-says-nothing-about-us furniture, and start to make our house say something about us, our style, our life. Thanks Lauren! I have always found things and brought them into my home because they remind me of both of my grandmothers. Such a great post Lauren! Thank you for a wonderful post! 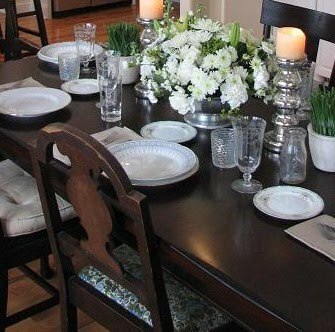 I have so many memories of the homes of family members from growing up in Virginia: most everything was neoclassical/traditional--with a dash of 70s and 80s plastic florals thrown in for good measure, so I totally know what you mean about not everything being "good" now.  ;) I, too, am drawn to patterns that remind me of those I grew up with, even in a reinterpreted way. And what a beautiful thought that the patterns and object we choose for our own homes today will become childhood memories for the little ones in our lives.